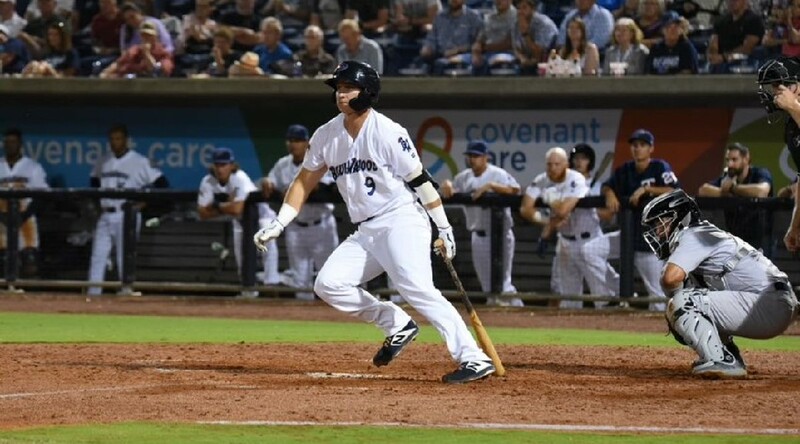 Brian Schales hit a two-run homer in a three-run first and the Blue Wahoos led all the way. Batting stars: Tanner English was 2-for-4. Schales was 1-for-3 with a two-run homer (his second) and a walk. Pitching stars: Jorge Alcala struck out seven in 5.2 innings, giving up two runs on four hits and two walks. Dusten Knight struck out two in 1.1 perfect innings. Opposition star: C. J. Hinojosa was 3-for-4 with a home run and two runs. Stats: English is batting .357. Luis Arraez was 0-for-4 and is batting .341. Alcala has an ERA of 2.30. Knight's ERA is 1.50. Record: Pensacola is 8-3, in first place in the Southern League South, three games ahead of Biloxi, Jacksonville, and Mississippi. Jose Miranda hit a three-run triple in the ninth to take the score from 4-3 to 7-3. Batting stars: Akil Baddoo was 3-for-4 with a home run (his second), scoring three times and driving in two. Royce Lewis was 3-for-4 with a double and a walk, scoring twice. Ryan Jeffers was 3-for-4. Pitching stars: Randy Dobnak pitched six shutout innings, giving up three hits and a walk and striking out four. Tom Hackimer pitched 1.2 scoreless innings, giving up a walk and striking out one. Johan Quezada pitched a scoreless inning, giving up a walk. Opposition star: Quinn Brodey was 2-for-3 with a double and a walk. Stats: Ben Rortvedt was 1-for-4 with a walk and is batting .313. Dobnak has an ERA of zero. Hackimer has an ERA of zero. Quezada has an ERA of 1.42. Record: Fort Myers is 8-4, tied for second with Bradenton in the Florida State League South, one game behind Palm Beach. Emmanuel Valdez hit a two-run homer in the first and the River Bandits led all the way. Batting star: Trey Cabbage was 2-for-4 with a two-run homer, his third. Opposition star: Shawn Dubin struck out seven in six shutout innings, giving up one hit and no walks. Stats: Gabe Snyder was 1-for-3 with a walk and is batting .389. Cabbage is batting .342. Starting pitcher Luis Rijo pitched 5.1 innings, allowing five runs (three earned) on eleven hits and one walk and striking out two.